Home Tags Posts tagged with "mark shurtleff"
Former attorneys general in Utah, John Swallow and Mark Shurtleff, have been arrested on bribery charges, authorities say. John Swallow, 51, and Mark Shurtleff, 56, are accused of accepting cash or campaign contributions from people facing potential scrutiny by the attorney general’s office. Both men are also accused of attempting to cover up the alleged schemes. If convicted, they face more than 15 years in prison. Both men have publicly maintained their innocence. “This is a sad day for Utah,” Utah Governor Gary Herbert wrote in a statement. Mark Shurtleff and John Swallow were arrested at their homes on Tuesday morning, Salt Lake County District Attorney Sim Gill told reporters, adding the investigation was ongoing and more charges may be filed. John Swallow currently faces 13 charges including felony bribery, and Mark Shurtleff faces 10 charges. Both are accused of accepting more than $50,000, as well as using personal property including a luxury jet and houseboat owned by a businessman in trouble with regulators. They also allegedly stayed at an expensive beach resort, and accepted meals, clothing and massages paid for by another man charged with fraud by the Utah attorney general’s office months ago. 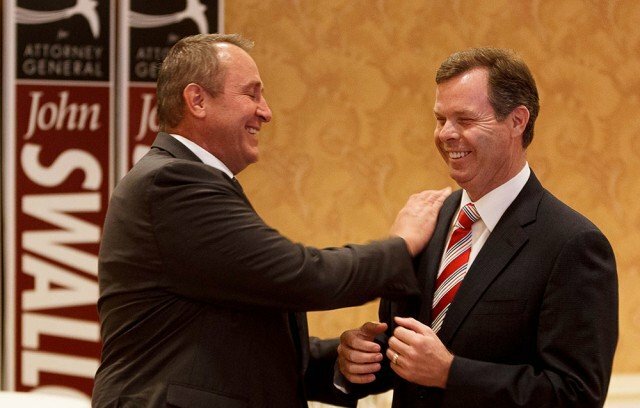 Mark Shurtleff was dogged by allegations of corruption while in office, departing in 2013 when John Swallow, his chief deputy, took the helm. John Swallow resigned later that same year, claiming the scrutiny was too much for his family. Probes by the US Department of Justice, the state bar and Utah elections officials were launched, and an investigation conducted by Utah lawmakers found John Swallow destroyed or fabricated records while in office. “I absolutely maintain my innocence. We refute the charges,” John Swallow told reporters on Tuesday as he left jail.